Eggplant is one of the world’s healthiest foods. 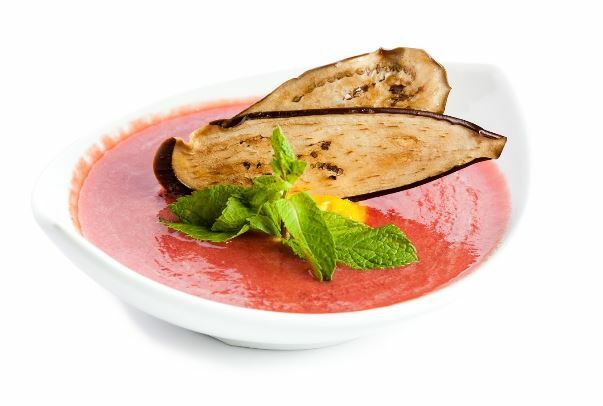 Eggplant is a rich source of phytochemicals, which are nutrients from plant-based foods. People who eat more phytochemicals have a lower risk for heart disease. Eggplant also provides a relatively high amount of dietary fiber. This recipe would be a perfect Meatless Monday option! It is delicious and I know everyone in the family will enjoy! Preheat a large iron skillet over close to medium heat. Peel the eggplant and chop into 1 inch cubes. Set aside. Add 1/4 cup of the oil to the skillet. Place half of the eggplant cubes into the skillet and spread evenly. Season with a couple big pinches of sea salt. Resist the urge to stir them until the first side is brown. Meanwhile, heat your medium sized soup pan over low to medium heat and add 1 tablespoon of oil. Add the onion, garlic, tomato paste, broth, turmeric, cinnamon, and salt. When it reaches a simmer reduce the heat to low. When the eggplant is brown on the first side add another 1/4 cup oil and stir. Resist the urge to stir them until the second side is brown. When the eggplant is nicely browned and tender add it to the oven with the other ingredients. Repeat the process of cooking the eggplant, using 1/4 cup oil while the first side browns, and another 1/4 cup as the second side browns. Transfer the eggplant to the soup pan, making sure to get all the yummy brown bits from the pan. Turn off the heat and use a hand blender to puree the stew to the desired texture. (You can also transfer to a food processor/blender and lightly blend to achieve the same effect). Serve with 1 cup cooked brown rice per person if following the ARD diet.